The Mutunga Five: 5 top contenders running for presidency. The petition filed at the high court by a group of group of civil society activists that seeks to compel the Independent Electoral and Boundaries Commission (IEBC) to bar permanently the top five presidential contenders from running for presidency may be fast fading from the Kenyan minds but its implications cannot be wished away. Truth be told, with the kind of judgments that have been witnessed from our courts since Justice Nicholas Ombijaâ€™s ruling on Omar El A Bashir to the ruling on County commissioners, Â is enough reason for the various presidential campaign teams have sleepless nights. Should the big five be disqualified by the courts from running for the presidency, would it give the 2nd and 3rd tier candidates read Martha Karua, Eugene Wamalwa, Moses Wentangula, James Ole Kiyapi, Mutava Musyimi, Paul Muite, Peter Kenneth, and Charity Ngilu an easy ride to State House? Methinks that a few of the second and third tier candidates may get elevated in a short run but Â will not necessarily be the hot favorites in the race. A quick look at the regions from which the top five candidates enjoy most support and their possible replacements indicates that most of the aspirants may not necessarily benefit, in fact they will retain their current support or gain a negligible support. In the absence of Deputy Prime Minister and TNA boss Hon Uhuru Kenyatta one could expect that the former constitutional minister Hon Martha Karua could easily sweep the region. However, the other candidates from the region including Hon Peter Kenneth, the 2nd liberation hero Safina Party Leader Hon Paul Muite and Rev. Mutava Musyimi would all be in contention for the regionâ€™s political supremo tag. Another important factor is that the regionâ€™s political direction has for decades been determined by a clique of business personalitiesÂ andÂ magnates who pull strings behind the scenes and will continue to hold sway on the direction the community will take in the 2013 elections. The other favorite who rivals Ms Karua for the endorsement by the rich and powerful in the region is Hon Amos Kimunya. Though perceived to be arrogant and lone ranger by some, the transport minister has a good rapport with the mighty and powerful in the region. Kimunyaâ€™s drawback will be corruption and tribal allegations. Scandals galore have dogged every ministry he has served. The scandals include but are not limited to those related to Grand Regency Hotel, the Syokimau demolitions order, the JKIA new terminal tender row and the De la Rue scandal. Hon. Mutava Musyimi, though not fully accepted by Kibakiâ€™s kitchen cabinet, presents an attractive compromise candidature among the elite in the region- he is a Kamba but represents a largely Mbeere constituency, and his close ties with President Kibaki makes him a friendly candidate to the Central Kenya voters. Other vocal politicians from Mount Kenya region have not grown their popularity beyond their constituencies or at best counties. 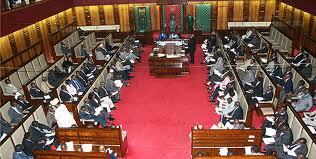 These include, Ephraim Maina, Kiraitu Murungi, Esther Murugi, Mwangi Kiunjuri and Joe Nyaga. My crystal ball is that the Mt. Kenya wheeler dealers are likely to pick a fresh mind and sell him to Kenyans; most probably a successful corporate personality. Â This is the logic- a successful corporate case may endear well with Kenyans especially with the current state of the economy. Such a candidate would be fast marketed by the deep pocketted Mt. Kenya elite across the country as the Mt Kenya votes will be almost a guarantee. The phenomenal James Mwangi or the technocrat John Njiraini tops the list of such an agenda. James Mwangi, an Â if chosen would obviously re energize the campaign trail by showcasing his success at Equity bank. He has also gained international reputation due to Equityâ€™s place as a case study of how a small financial lending institutionÂ can be expanded from a small village branch into a multi-country regional business operation with one of the largest customer base, branch network and healthy bottom-line in Kenya. He would be positioned as a performer and a force for poverty alleviation. That if he can transform Equity, he can reform Kenya. No region rivals Western Kenya in fielding candidates for next yearâ€™s presidential elections. Some of the aspirants have been labeled projects doing the bidding for their masters. But those who stand out incase Mudavadi is barred from contesting include Speaker Kenneth Marende, Cyrus Jirongo and Eugene Wamalwa. Eugene Wamalwa has generated some excitement in the region more but his lack of financial muscle will spell doom to his ambitions. Speaker Marende based on his solomonic rulings at 10th parliament has earned him goodwill across Kenya notwithstanding his occasional goofs. Cyrus Jirongo is a house-hold name; despite his dubious links to the defunct YK92 he has not been able to gain national momentum. In Nyanza it is rather obvious that the most suited candidate will be Lands minister Hon James Orengo. The minister is well respected by his peers, president Kibaki once told parliament that the Kenyan constitution can be written single handedly by Orengo. He may have not registered much success at Ardhi House but as a second liberation hero who has vied once for the presidency (2002 Elections) puts him a head of the pack. Orengo is close to Prime Minister and as such is an asset in Nyanza politics. Cabinet minister Dalmas Otieno ranks well just as well as the corporate magnet Evans Kidero. Since Nyanza responds positively to any direction Raila Odinga may give, it will not be surprising for Raila Odinga to endorse National Assembly speaker Kenneth Marende, such a support would most definitely put Marende far ahead of his Western Kenya competitors. Hon Speakerâ€™s performance at the tenth parliament has been exemplary and many communities will accept him as a voice for reason. The only challenge I foresee is his financial muscle, highly unlikely that he can foot the bills of a presidential campaign. However in the event that such a scenario takes shape, then he stands to be bankrolled by the PMâ€™s network. In the event that Hon William Samoei Ruto, the de facto URP leader is blocked from running, there is no straight forward candidate. Most of his trusted lieutenants have no visibility beyond their counties; and this may require him to cast his net far wide. A surprise endorsement of Information and Communication Minister Hon. Samuel Poghisio will definitely make more sense than that of former speaker Hon Francis Ole Kaparo who is also the chairman of Rutoâ€™s party- URP. Hon Poghisio who hails from West Pokot is non confrontational, sober and articulate. He can be a unifying figure for the country the fact that he comes from a minority tribe. Vice President Kalonzo Musyoka has a natural replacement in Water and Irrigation Minsiter and Narc Presidential Candidate Hon Charity Ngilu. However, due to their frosty relations over the years, Musyoka may wish to see another person emerge. Ngilu lacks the financial muscle, and her credibility will be on the cards; scandals that have engulfed parastatals under her ministry and her close allies may be used as propaganda to against her. Nonetheless Education Minister Mutula Kilonzo may as well throw himself into the ring. Mutula is credited as being the sole think tank of the Wiper Party, he literally crafted Kalonzoâ€˜s inclusion in the coalition government. He has shown considerable respect for other politicians especially Prime Minister Odinga since his political debut in 2002and their LDP days as the team leader of the Orange team that thrashed the Banana team in the 2005 referendum. Mutula is intelligent and can activate his old KANU networks for financial support. Itâ€™s during his tenure as justice minister the country got a new constitution and most of the important bills that were crafted during his tenure have since been mutilated by Eugene Wamalwa. This is a thoughtful observation but I think there is little possibility that Willy Mutunga's hammer shall fall against the five. Just like hide guidance on MRC, barring the five is as explosive as ICC denying Uhuru M. Kenyatta and Hon William S Ruto chance of contesting elections in the coming GE. This is mere propaganda, misplaced opinion!